Maximum current per channel: 1A Max. 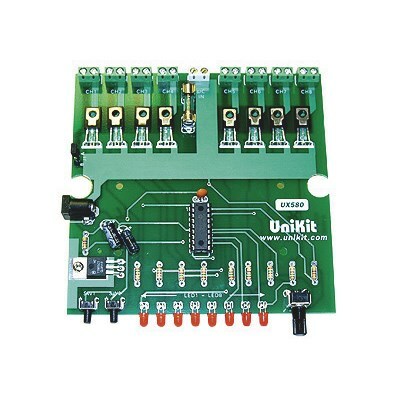 The controller can handle DC lights of between 6 to 24V DC on the output and up to a maximum of 1A per channel. This allows for connection to groups of hundreds of LEDs as well as high power LEDs and LED light strips. The circuit incorporates a speed adjustment control as well as a push button switch that allows reversing the running direction of the current light pattern. It has many applications such as traditional running light effects, Christmas lights, traffic safety arrow light boards, etc. A custom case with silk screened panels is available under CanaKit part # BX580. An AC version is also available for AC lighting applications under CanaKit part # CK570 / UK570.